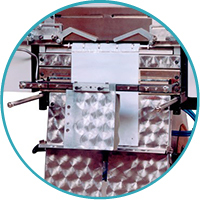 Light Safety Curtain LC-10 Light curtain acts as a safety device to reverse the pressure seal bar and stop the operation of the bagger when objects are detected in the sensing area. Includes light screen controller, mounting brackets, interface cables, safety relay, program enabled in PLC. 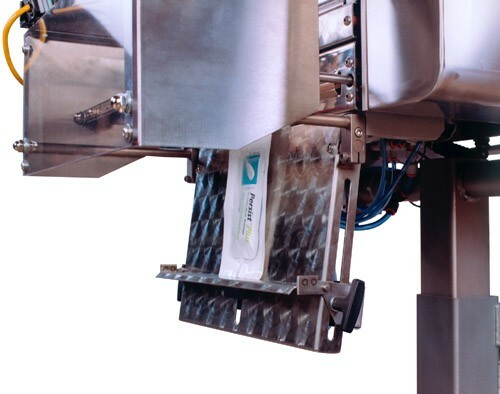 Note Optional trailing edge signal available to automatically cycle bagger when object or hand leaves light curtain field for “hands-off” packaging. This option increases production up to 40% versus footswitch or dual palm button operations. Load Shelf LS-10 Supports the bottom/ back of bag during loading of heavier or bulkier products. 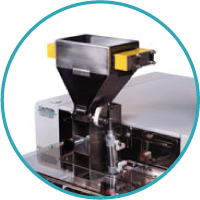 Pneumatically operated, adjustable shelf provides support and takes initial impact of heavier products dropping in the bag. Shelf tilts downward after sealing, dropping product from shelf. Various lengths for longer bag sizes. Kit contains day to day normal wear items. 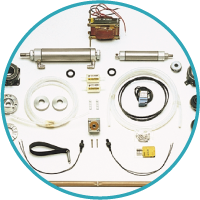 PTFE sheet, filter, fuses, seal rubber, and heater cartridges identifies some items in the kit. Funnels are in stock at all times with sizes ranging from a 1″ opening to a 7″ opening. Custom funnels are also provided to facilitate loading. Having the proper funnel and bag size for your product is very crucial to an efficient operation. 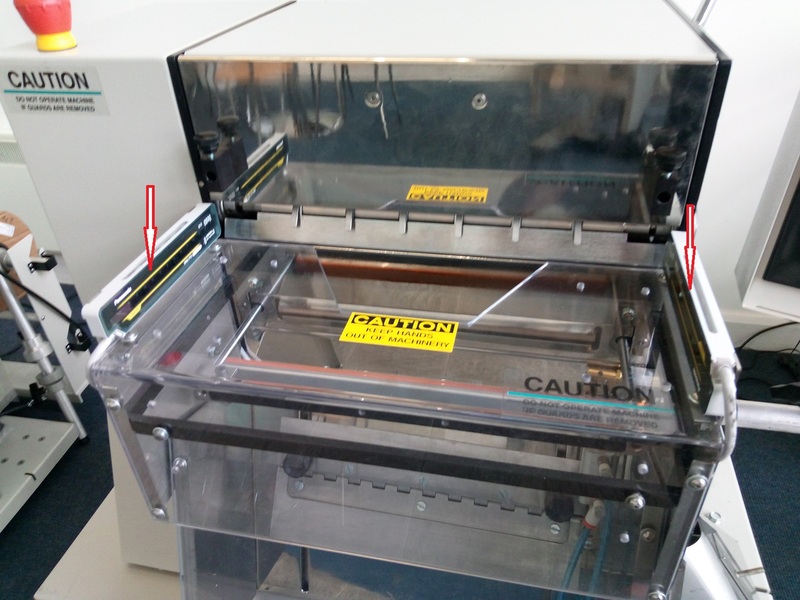 Stainless steel partitioned utility table keeps products separated for manual kit packaging. Two sizes available depending upon size and quantity of product. Adjustable tilt and height to fit over bagger. OSHA approved safety device. Two optical “no-touch” buttons must be pressed simultaneously to initiate the cycle operation of the bagger. If the two sensors are not pressed at the same time, the bagger will not cycle, ensuring that fingers or hands cannot be in the seal area. Recommended when no funnel is present. 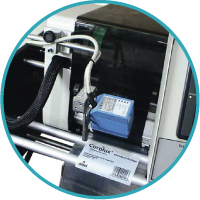 Verifies that barcodes on preprinted or thermally printed bags are readable and stops the cycle operation when a non-readable barcode is detected. Decreases the possibility of wrinkles in the seal area while increasing seal integrity. 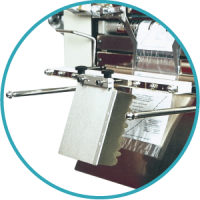 Pneumatically operated opposing “fingers” pull each side of the bag taught above the seal area to flatten the seal area. 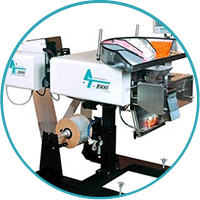 We have a lot of products and machinery to do the job, if you’re having trouble choosing which Bagging Machine / Automation suits your company best, give us a call or drop us an email and we’ll be happy to offer our expertise and professional opinion on our machines.